In just a few releases, Dallas foursome, The Happy Alright, have proved that they’re not just like every other pop-punk act out there. They show tremendous growth with each release and are on the cusp of releasing their best set of songs to date. I sat down and talked with the guys about their new EP, Vacancies, as well as where the band has been and where it’s off to next. First off, why don’t you introduce yourselves and give us a little background for The Happy Alright. Mason Steeger: I’m Mason, I play bass and do some backup vocals from time to time and I joined the band in 2013. Sterling Gavinski: I’m Sterling, I play guitar and sing. Brad and I started the band back in 2011. Brad Barteau: I’m Brad and I play drums. Your sound is pure pop-punk perfection, where do you guys draw your inspiration from? Mason: My music taste is all over the board (laughs). One minute I could be listening to Full of Hell, and then just have the urge to jam some Lady Gaga. Whenever I write lyrics I draw lots of inspiration from The Wonder Years, Knuckle Puck, and Real Friends. Musically I like to draw from those bands as well, but I think it’s cool to implement things from all over the place as much as possible. Sterling: Some of my personal, biggest influences are great songwriters like Brian Wilson, Kanye West, Billie Joe Armstrong, Rivers Cuomo, Bruce Springsteen, Dan Campbell, Max Bemis, and John Darnielle of The Mountain Goats. We share a lot of common favorite bands like The Wonder Years, as Mason said. Brad: My top three favorite bands would be Soundgarden, The Foo Fighters, and Title Fight. I draw inspiration from music, nature, and art. You guys have been pretty busy recently, you guys just released your Esperando EP and are about to drop another EP, Vacancies. Was it planned to release another EP so soon or did it just kind of happen? Mason: We really felt like it was important to put something out as quickly as possible and do as much as we can in a short amount of time. I can’t speak for the others, but I’d love to do this full time and doing that means just putting in as much work and doing as much as you can. Sterling: We knew we wanted to release more music. It was just a question of “when?” and “why not sooner?” (laughs). I think it would be cool if we released even more songs this year after Vacancies. Brad: I think we kinda just ended up with a bunch of new songs at the end of the summer and really didn’t have anything to do with them besides record them. So here we are. Honestly, I’m hearing a lot of growth already from Esperando to Vacancies, was there anything you guys did differently for the writing or recording process between the two or is it possibly a result of doing some live shows and playing together more? Mason: Thank you! I think we’ve grown a lot closer in the past year and we actually spent time writing together. Before now it was mostly Sterling doing all the writing, but we all contributed to this one, except Jonathan because he joined after we wrote everything, but it’s all good (laughs). Sterling: Not only was the process more collaborative, we’ve definitely grown as people and that affects the music we make. It’s really great to hear that someone notices your growth as a band. I think that’s really important as far as proving your longevity as an artist: the potential for growth and even change. What was the writing process like for Vacancies? Mason: Brad, Sterling, and I spent a week at Brad’s house this past summer where we basically just locked ourselves in a room for 10 hours a day and did as much as we could. We came out with 5 songs, but only really were sold on two of them, so Sterling and I met up over the fall semester of school whenever we could and got the other three that made it on the EP. Sterling: We watched the Jurassic World premiere that week and I’m pretty sure that made us write good songs. In all seriousness, we hustled and essentially grabbed the best riffs, parts, fills and lyrics from that week. I think that process allowed us to get only the absolute best parts from the chaos of all the songs we ended up pumping out. Brad: I remember sitting in my room for the first week of June with Sterling and Mason and drinking a lot of peace tea and burning incense. Is there a song on the new EP that any of you are particularly excited for people to hear? Mason: I’m kind of biased, but “Parking Garage.” I wrote the lyrics to this one with some help from Sterling and I’m really excited to see how much people like it. Sterling: I’m pumped for people to hear “Flower.” It was written essentially in the studio as we recorded. I think it’s a pretty good musical summary of what THA sounds like in 2016. Brad: It’s hard for me to pick one out of the five. Each song has a separate personality while they all share one common theme. I like to look at the EP as a whole and i’m excited to see how it is received. For anyone out there that is just discovering The Happy Alright, is there a song that you feel they should listen to as an introduction to the band? Mason: That’s a tough one… My favorite to play live right now (since we haven’t really been performing stuff off the new EP) would probably have to be “Lost at Home.” That’s the first one we wrote together as a band and it came together really quickly and got us really excited for the release of Esperando. Sterling: I definitely would say “Lost At Home” as well. Personally, the song has a special place in my heart lyrically. Also, I feel like it kind of symbolizes that chapter of our band pretty well. I really hoped it would feel kind of like a cliffhanger ending to that EP when we wrote it, so I really hope it gets people psyched for Vacancies. You guys just did your first west coast tour, do you have a favorite show or memory from that tour? Mason: Besides meeting our amazing friends, Quiet Things and Paper Planets, in Oklahoma (which was the best show by the way) I’d have to say my favorite thing that happened was a guy trying to sell us weed not 5 minutes after our feet hit the ground in Colorado (laughs). We respectfully declined, but I just thought that was kind of funny. Sterling: Our best bud in the world, Gavin Pham, came along to help out with the tour. He had an ominous dream about a bear attacking him at a pool party or something one night… And then the rest of that next day, we just happened to see lots of billboards and t-shirts at truck stops with BEARS on them. He was pretty scared. Brad: That was the greatest week of my life. I think my favorite memory is eating huevos rancheros in Santa Fe, which gave us all uncontrollable gas, and then Johnathan getting called out by the sound guy in Flagstaff for crop dusting. What’s next for The Happy Alright? Are you guys writing any more new tracks? Is there a tour on the horizon? Perhaps plans for a full length LP? Mason: Sterling and I are still writing and hoping to get together to hash out some ideas soon, and would definitely like to release a full length in the not too distant future. As for touring, I’ll just say we’re gonna be visiting some new places pretty soon and we’re very excited about it! Sterling: As cliché as it sounds, anything is possible, and we are willing to try just about everything. It’s gonna be a really fun year and I hope we get to make a lot of new friends and do try new things. Brad: We will be getting a van very soon. 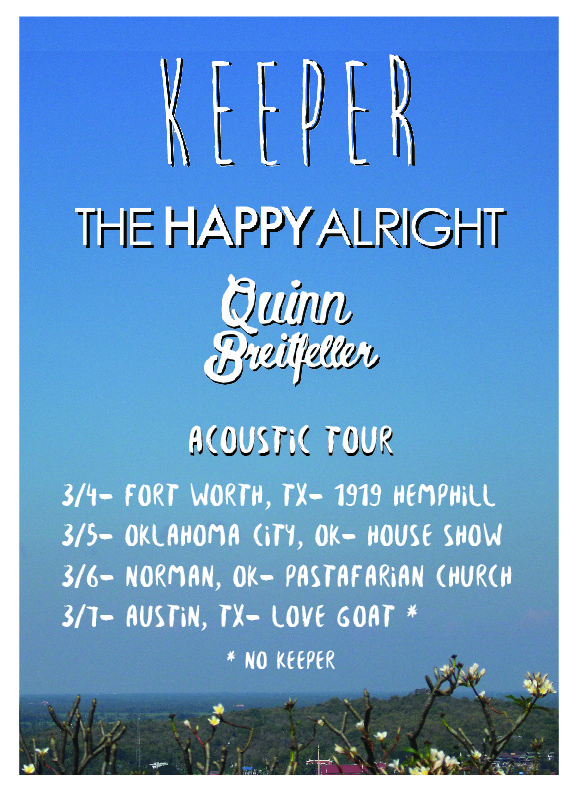 The guys are heading out on a short acoustic tour (see below for dates). Make sure to check out my review of Vacancies which you can preorder over on Bandcamp.